Actor Jussie Smollett told cops that he had an untreated drug problem after his arrest, according to a new report. 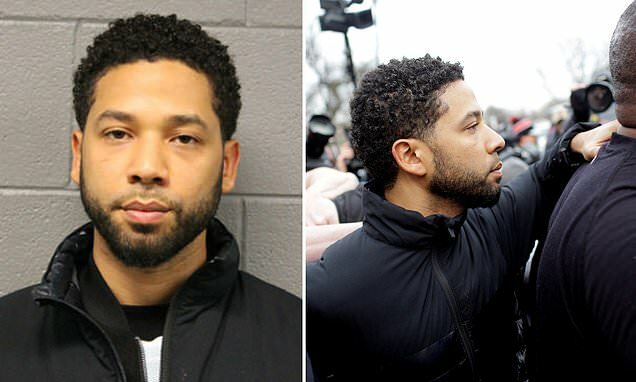 Though Smollett, 36, continues to deny he staged a racist and anti-gay attack against himself as a hate crime hoax, he confessed to police in Chicago that he struggles with drug issues after his arrest on Thursday, according to TMZ. Smollett responded 'no' when asked about alcohol or mental health problems, according to booking documents. But he may have dropped hints about a drug issue to lay groundwork for a possible defense strategy. Meanwhile, stunning details have emerged about the massive technological push that police used to unravel Smollett's claim that he was attacked by two white men shouting slogans supporting President Donald Trump on January 29. Police tapped into Chicago's vast network of surveillance cameras - and even some homeowners' doorbell cameras - to track down two brothers who later claimed they were paid by 'Empire' actor Jussie Smollett to stage an attack on him, the latest example of the city's high-tech approach to public safety. Officers said they reviewed video from 55 cameras to trace the brothers' movements before and after the reported attack, determining where they lived and who they were before arresting them a little more than two weeks later. Smollett reported being beaten up by two men who shouted racist and anti-gay slurs and threw bleach on him. But his story fell apart when Abimbola and Olabinjo Osundairo - bodybuilders and aspiring actors whom Smollett knew from the 'Empire' set and the gym - told police that Smollett paid them $3,500 to stage the attack because he was unhappy with his salary and wanted to promote his career.